Fried onion rings work well in so many situations. 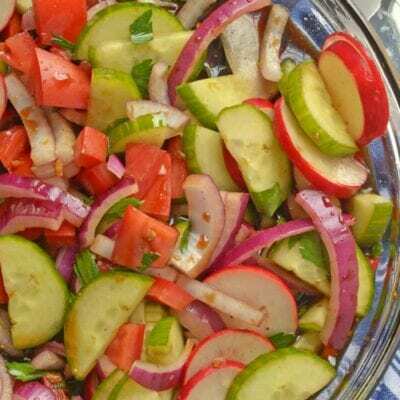 Are they a topping, appetizer, or side dish? They can work where ever you put them and be loved all the same! 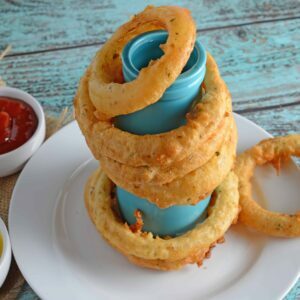 This crispy onion rings recipe is the perfect side dish to complement burgers, hot dogs or even pizza! 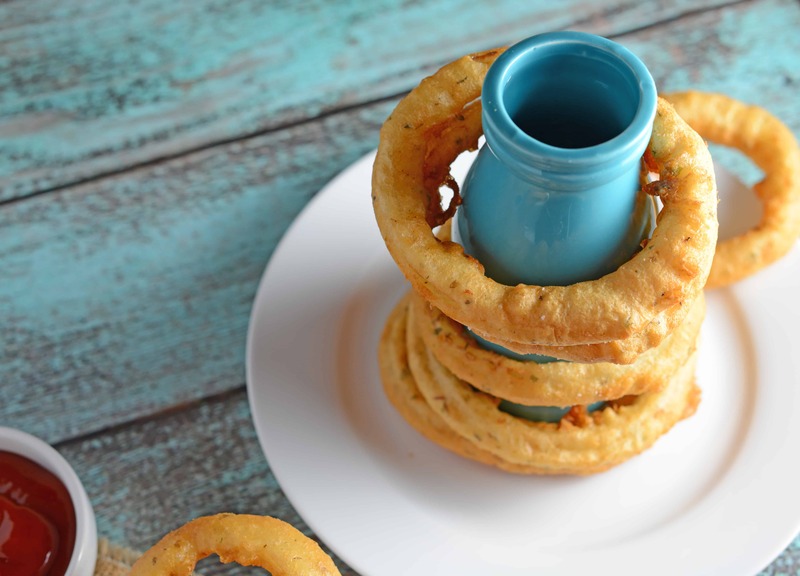 Who doesn’t love Beer Battered Onion Rings? I call them “Oh, Oh” rings! I think many are intimidated by making onion rings at home. 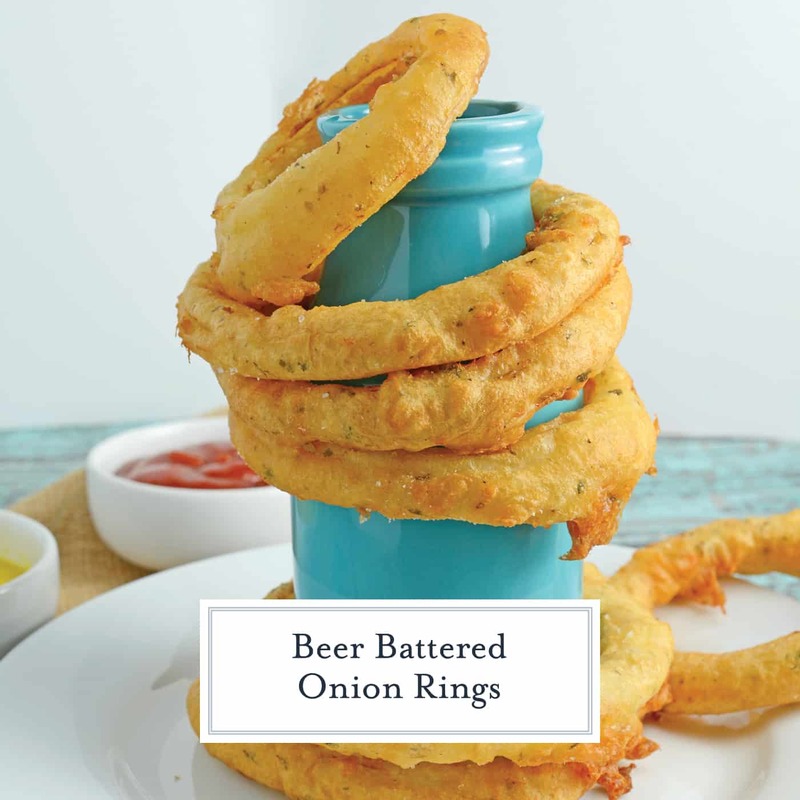 The frozen version can come out soggy and lack flavor, but my Beer Battered Onion Rings recipe packs a lot of crunch and spice! The two best combinations in one. One batch of remoulade can also be used for other items with the same meal or later in the week, such as a Chipotle Chicken Club sandwich. 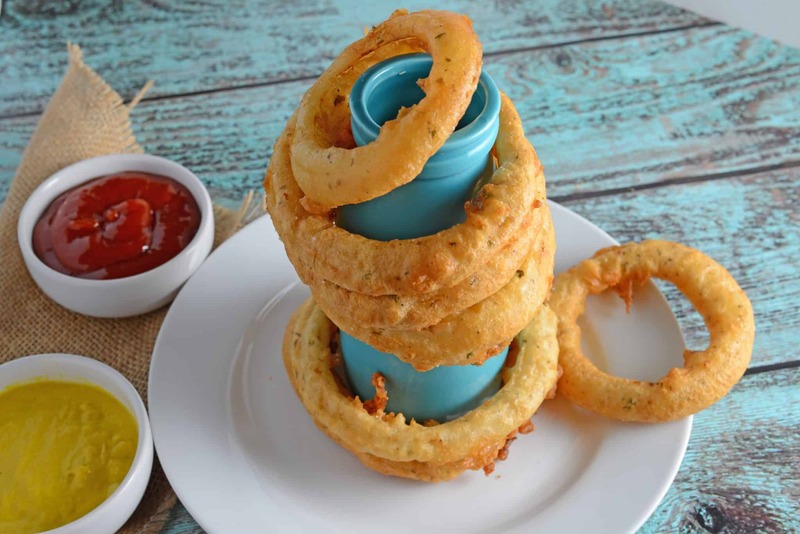 Onion rings can be a side dish, appetizer, or used as a topping on a burger, or served with a delicious steak. What a versatile food!
. 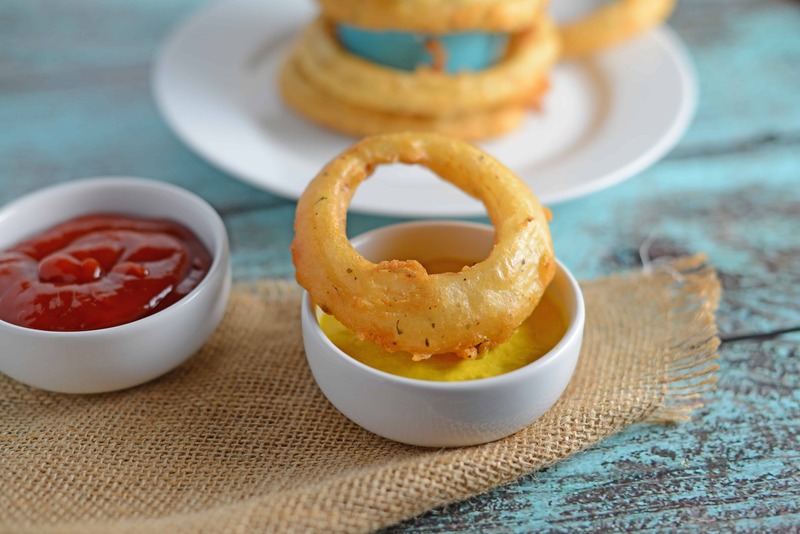 High sides can create a steaming effect, preventing your Beer Battered Onion Rings from getting nice and crispy. Because the side are so low, you should also invest in a splatter screen to prevent messy oily all over your stove top and burns. And wear an apron or clothes you won’t be sad about having stains on. My John Elway jersey might have evidence of onion rings and chile relleno bites permanently embedded on it. – For frying anything, a splatter screen will prevent burns and stains. 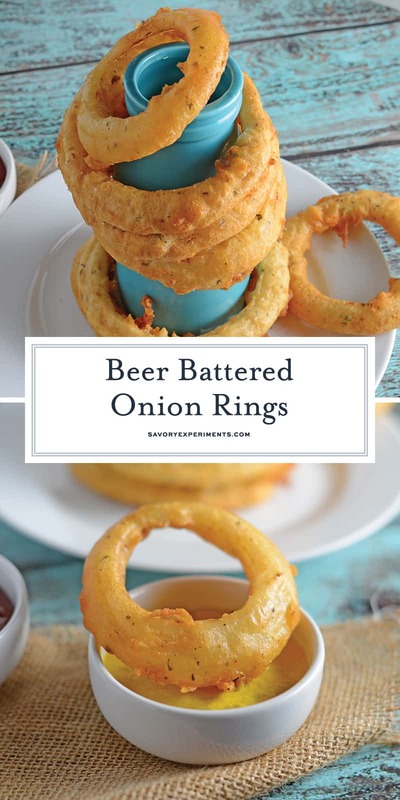 Beer Battered Onion Rings Recipe - Crunchy and crispy homemade beer battered onion rings. 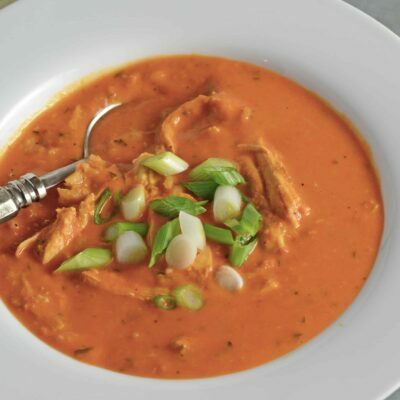 Dip in a spicy chipotle remoulade or eat alone. Peel and discard the outer skin of the onion. Slice into 3/4 inch wide rings, set aside the centers (anything too small for an onion ring). Separate all rings from each other. 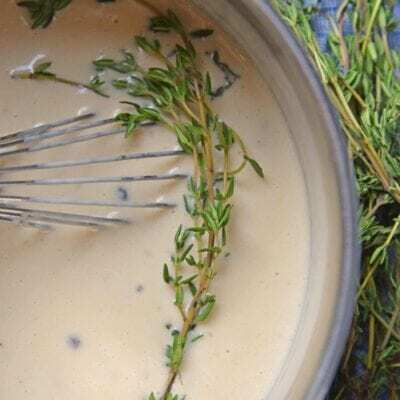 In a medium bowl combine 1 cup flour through oregano and whisk together. It will be a thick and pasty. Slowly whisk in beer. 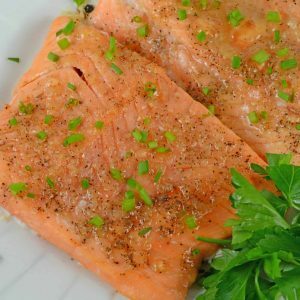 Place in the refrigerate for at least 15 minutes. In a large heavy frying pan, heat oil over medium-high heat. You can test the oil by dripping a small drop of batter into the oil, if it starts to float and sizzle, the oil is ready for frying. Also preheat oven to 250 degrees. Dredge each onion ring in remaining 1 cup of flour and then in cold beer batter. Working in batches, place 4-10 onion rings in the oil, being careful not to crowd the pan too much. Cook for 6-8 minutes turning every 2-3 minutes to evenly brown. You don't want them to cook too fast otherwise the onion inside won't cook. Remove each batch to a paper towel lined baking sheet. Sprinkle each batch with desired amount of sea salt after removing. Place them in the oven to stay warm until you complete frying all onion rings. 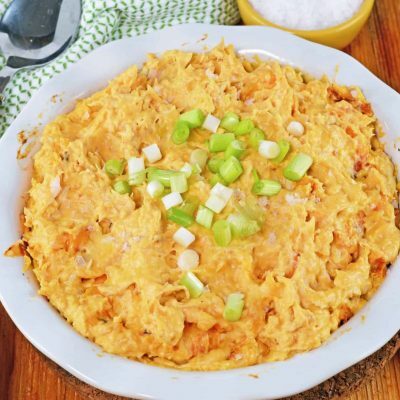 When you are through with all batches, serve with chipotle remoulade. I could live on beer battered onion rings! 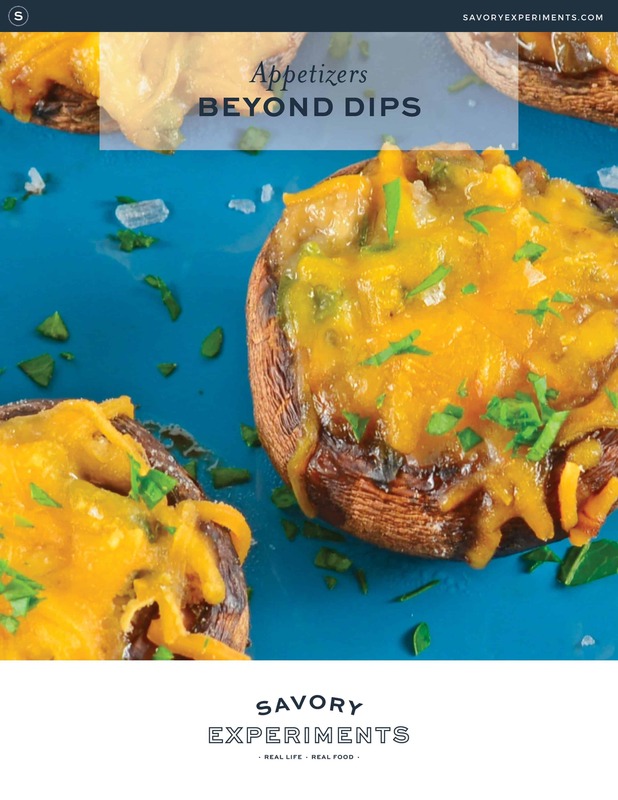 These look so light and crisp! 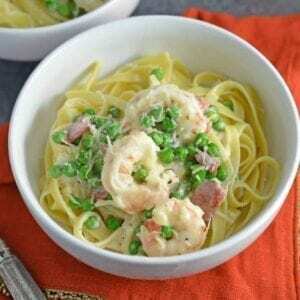 I can’t wait to make this recipe!! I’m so over frozen onion rings for the reason you mention. These are on my hit list to make now autumn is approaching – thanks for your cooking tips, they are handy to have.